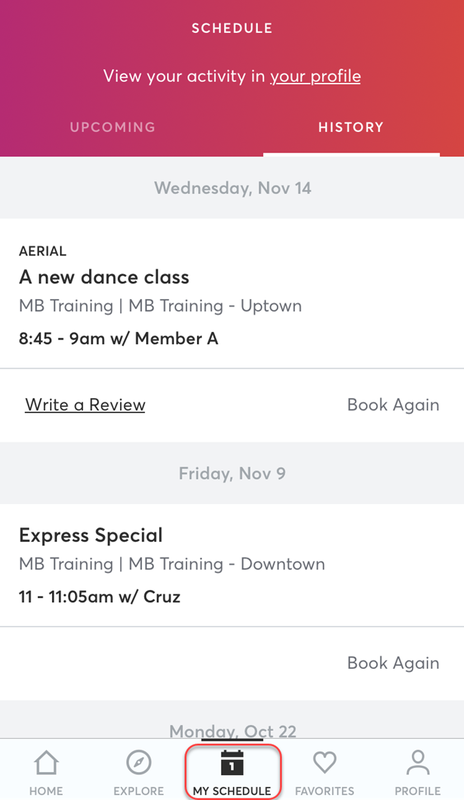 Your MINDBODY app schedule is conveniently located on the dashboard, labeled as MY SCHEDULE on the bottom. The schedule includes a two-part menu, Upcoming & History, which is accessible by swiping left or right to cycle between the two menus. The Activity Dashboard is also available from the schedule menu by a direct link at the top (see View your activity in your profile). What types of reservations can I expect to see in my Schedule? Note that recurring workshops cannot be booked from the app, nor will they appear in My Schedule when booked online or in person. It looks like I'm missing some older visits. The MINDBODY app will display up to 30 scheduled & past visits at a glance. More data can be loaded by swiping further down. Any additional visits that may be needed can be found on the website with the business your visit history is archived with. If you need a PDF of your visit history, please reach out to the corresponding studio directly with the details of your request to allow them a chance to respond. I'm still missing visits from one or more businesses, what happened? Not seeing any visits or passes with a specific business? No worries! Try syncing your account here or start a chat with us so we can help you get linked with the business. Where is the waitlist status? If you have waitlisted for a full class, your position in the class waitlist will be found by tapping on the class detail under Upcoming visits. At the top of the Class Detail screen, you'll see "Waitlisted. You are # in line." What schedule integrations are available? My app menus look nothing like this, what happened? It's possible you may be using an outdated version of our app! If so, please check the app store for the most up to date version of MINDBODY available to you. Upon updating, it should refresh your app to look more like the reference image above. Welcome back!